It is my great pleasure to join you at this business lunch. 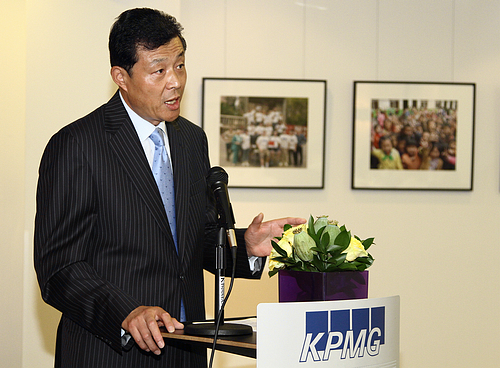 I wish to thank KPMG and Chairman Reid for their thoughtful arrangements. Most of the well-known multinationals represented here have either invested in China or are exploring that possibility. I am glad to find that your enthusiasm about China is just like the weather here in London at the moment -it is getting hotter day by day. 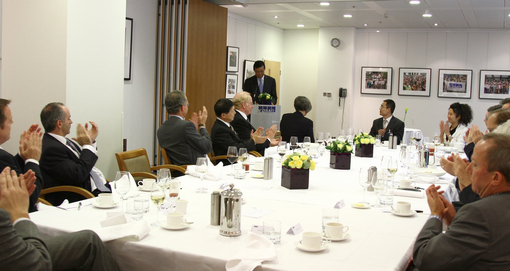 I would like to update you on the latest economic trends in China and talk about the prospects of investing in China. As you may know, China was among the first leading economies to recover from the international financial crisis last year, thanks to the decisive measures taken by the Chinese government. This recovery is continuing into 2010 and is putting the economy on a more solid footing. Firstly, we have seen faster economic growth. The first quarter of this year saw an 11.9% GDP growth, 1.2 percentage points higher than the fourth quarter of 2009. We also saw expanding demand both domestically and internationally. On the one hand, consumption contributed to 52% of the first-quarter GDP growth, and on the other, international demand picked up fast with exports up by 33.2% in the first 5 months of this year. Secondly, there has been a higher quality of growth. Fiscal revenue, business profit and people's income, in both urban and rural areas are all growing. The Chinese government has invested more than half of its 4-trillion-yuan stimulus package into providing better public services for the people. In the first quarter of this year, per capita income for rural residents increased by 9.2% and that for urban residents grew by 7.5% in real terms. Thirdly, we have created a stronger market confidence. China's Purchasing Manager's Index (PMI) stood at 52.1 in June, remaining above the threshold level for the last 16 consecutive months. And the Consumer Confidence Index (CCI) in the first quarter was at 108, the highest since 2007. 4.56 million more people in the cities found jobs in the first quarter, up by 3.8%. The financial crisis has not hindered China's long-term development. The Chinese economy is still at a stage of fast growth, and will continue to provide investment opportunities for businesses from the UK and other parts of the world. Some people, foreign investors in particular, seem to be worried about recent adjustment of China's foreign investment policies, fearing that China is not as welcoming of foreign capital as before. I believe such worries are unnecessary. Let me explain why. In China's 4-trillion-yuan stimulus package and its program for rejuvenating industries such as electronics, information technology, logistics and equipment manufacturing a lot was devoted to further opening-up, absorbing foreign capital and stepping up international cooperation. China has offered both foreign-invested and home grown businesses equal opportunities to participate among the 12,439 international tendering projects for machinery and electronic products in 2009. Foreign-funded companies took part in 8,863 of them and won 6,887 or 55.4%. Foreign capital has been offered great opportunities as China expands its domestic demand. With the accelerated industrialisation and urbanisation, internal consumption market in China is expected to top 2 trillion US dollars this year, which far exceeds China's exports. Many multinationals hit hard by the crisis have found fresh opportunities in China. General Motors saw its sales in China increase by two thirds, with over 1 million cars sold in China, between January and May this year alone. If the Chinese market is a cake, foreign businesses can absolutely get a considerable slice of it by investing in China. The Chinese government continues to encourage and welcome foreign investment. To help facilitate this, 26 types of investment are exempt from central government approval. In 2009, over 23 thousand foreign-funded enterprises were set up nationwide, of which only 56 went through Ministry of Commerce. China has also amended the Catalogue for the Guidance of Foreign-Invested Industries four times to broaden market access and a fifth round of amendment has started. Not long ago, the Chinese government issued new rules to channel more foreign capital into a variety of sectors including high-end manufacturing, high-tech industries, modern services, new energies and energy-saving and environment-friendly industries. It has also acted to encourages foreign businesses to relocate or increase their investment into the central and western parts of China. China places a high importance on the role of foreign capital to help foster technological advancement and home-grown innovation. This holds out a great prospect for further expansion of multinationals in China in such areas as the green economy, new materials, new energies, bio-pharmaceuticals and innovative business models. Two very good examples are Vestas, who with two of the largest manufacturers of wind turbines, has set up factories in China, and CompAir who has built a manufacturing facility to produce compressed natural gas equipments. Statistics and surveys show that foreign businesses have confidence in the Chinese market and speak highly of what the Chinese government has done to make investment easier. Surveys by authoritative organisations suggest that China is still a leading destination for foreign investment. By May this year, foreign-funded companies in China totalled nearly 690 thousand, with a paid-in investment of 1 trillion US dollars, making China the largest recipient of foreign capital among developing countries for 17 years in a row. Volkswagen recently announced a plan to invest another 1.6 billion euros in China during 2011 and the American Chamber of Commerce in China plans to increase US companies' value in China to 1 trillion US dollars within 30 years. TESCO has also announced its intention to invest an additional 2 billion pounds in China over the next 5 years. Visionary businesses will not allow this golden opportunity to slip through their fingers. I want to mention in particular that the Chinese government has always attached great importance to Intellectual Property Rights (IPR) protection and has made it a national strategy. Ensuring better IPR protection through legislation, law enforcement, training and publicity campaigns, the IPR of UK businesses will be increasingly well protected in China. As a developing country whose IPR system has been in place for less than 30 years, we are working especially in terms of law enforcement, as we do not want to evade problems. But we will work harder and engage in more international exchanges and dialogue in the area to improve and strengthen IPR protection. Francis Bacon once said "A wise man will make more opportunities than he finds". I hope you, the UK business leaders, will seize the opportunities, make more of them and be successful in your endeavours. I can assure you that the Chinese Embassy in London will assist you wherever necessary. Thank you. I would like to take your questions.